The TCM uses the vehicle speed signal and signals from the transmission speed sensors (NC, NT) to detect the actual gear (1st, 2nd, 3rd, 4th, 5th or 6th gear). Then the TCM compares the actual gear with the shift schedule in the TCM memory to detect mechanical problems of the shift solenoid valves and valve body. The engine revs freely when 4th, 5th, or 6th gear is commanded (2-trip detection logic). When 1st gear is commanded, 4th gear is engaged. When 2nd gear is commanded, 4th gear is engaged. When 3rd gear is commanded, 4th gear is engaged. The TCM commands gear shifts by turning the shift solenoid valves on and off. According to the input shaft revolution (speed), intermediate (counter) shaft revolution (speed) and output shaft revolution (speed), the TCM detects the actual gear (1st, 2nd, 3rd, 4th, 5th or 6th gear). When the gear commanded by the TCM and the actual gear are not the same, the TCM illuminates the MIL and stores the DTC. 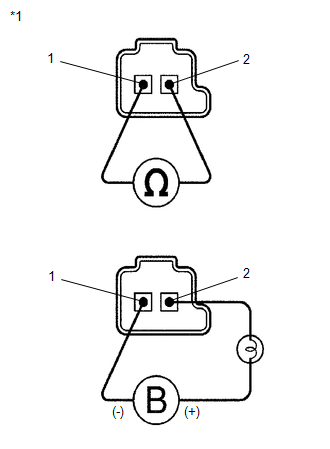 If a solenoid is stuck OFF, DTCs for several solenoids including the malfunctioning solenoid will be detected.